TS ICET 2019 Notification Schedule |Telangana ICET 2019 (M.B.A, M.C.A Admissions): TS MBA MCA Entrance Test 2019/#TS #ICET 2019: Telangana State Council for Higher Education, allotting various entrance examinations to different universities in the State has allotted TS ICET-2019 Entrance Test to Kakatiya University. 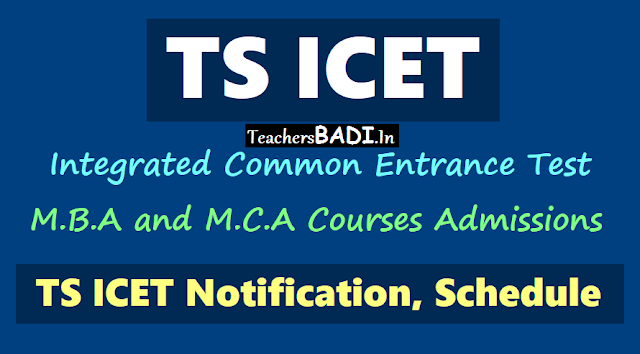 The Telangana State Integrated Common Entrance Test (TS ICET)-2019 notification will be released in the month of February 2019 and online registrations will commence in the month of March. A common Entrance Test, designed as Integrated Common Entrance Test 2019(ICET 2019) will be conducted by the Kakatiya University for entry into the first year of M.B.A and M.C.A Courses offered for the academic year 2019-2020 in the Telangana State on behalf of TSCHE and the University Officials have released the examination schedule on ....... February 2019. The website will be operational from March 11 Students can register by paying Rs 250. TSCHE chairman said that 75,000 students are expected to take the examination. The convener of the test said students can download the hall tickets from the website. The examination will be held on May 23 and 24 and preliminary key will be released soon. The results will be announced. Telangana and Andhra Pradesh candidates who wish to pursue MBA course from Dr BR Ambedkar Open University (BRAOU), here, should qualify in the Integrated Common Entrance Test (ICET) conducted by both the States. READ | How to Achieve the TS ICET? a) The candidates should be Indian Nationals and should satisfy local/non-local status requirements laid down in the Telangana State Educational Institutions (Regulations of Admission) Order, 1974 as amended up to date (as per G.O. Ms.No. 25, dated: 19.03.2004 & G.O.Ms.No.108, dated 3-7-2005,Higher Education Department, dated 30-7-2005 and its amendments). d) The qualifying Degree obtained by Distance Mode Program should have recognition by the joint committee of UGC, AICTE and DEC.